Handmade wooden jewelry boxes appeal to both everyday jewelry shoppers and collectors. Many beautiful options are available in a variety of woods and designs. Buying a handmade jewelry box over a factory manufactured product is a great way to support artists. Handmade wooden jewelry holders also generally show a level of craftsmanship in the artistic details that may be missing in a mass produced jewelry box. You will prefer a handmade jewelry holder if you like one-of-a-kind artistic designs. Wooden jewelry boxes come in a number of designs that can appeal to people of all ages and tastes. There are whimsical styles aimed at children, feminine designs for women and tailored ones for men. The boxes come in all sizes ranging from small ring-sized containers and classic single-compartment rectangle boxes to large chests with multiple partitions for all types of jewelry. Rectangular wooden jewelry box with decorative hand-carved jade and brass accents. You can choose a box made out of the wood of your choice. For an original design, you can make your own wooden jewelry box. If you are new to woodworking, you can learn simple patterns from craft books and find free box plans online at sites like Jim Barry's Woodworkers' Workshop. The Internet has free jewelry box plans for all woodworking skill levels from beginners to skilled craftsman. To save money, pick a less expensive wood, such as oak or poplar, for your beginner projects and practice pieces until you get more skilled. Use free plans from online to practice your first attempts at making a jewelry box before investing in jewelry box craft supplies. These first few projects will give you a sense of what types of tools you need and which items already in your toolbox and garage will work. You don't need to invest in a lathe unless you plan to regularly make jewelry boxes or other wooden crafts. You can create quality wooden jewelry boxes with tools already on hand. These basic tools may be all that is necessary for most box plans: sander, jig and sabre saws, drill, file, router and hammer. Take a craft class on making wood jewelry boxes to learn woodworking in a fun group environment. 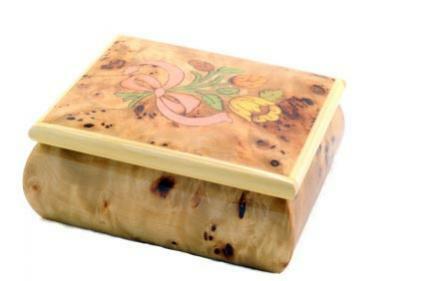 Heartwood: Heartwood sells handcrafted wood jewelry boxes in a variety of intricate designs. Wooden Wood: Wooden Wood features the wood crafts of artist Akemi Hoffman. All crafts are made from Pennsylvania hardwood. Akemi creates a large range of artistic designs. Amazon: Amazon has a selection of handmade jewelry boxes made from a variety of woods. Enjoy shopping for a handmade jewelry boxes. You will know your special box once you find it.